Micro-mesh metal tray keeps food fresh and dry! 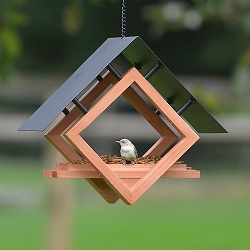 Adjustable clear dome allows you to exclude large birds! 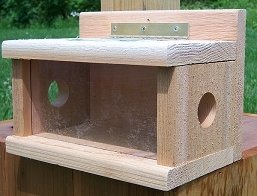 This cleverly designed mealworm feeder not only allows you to attract a variety of different species into your yard but also allows you to regulate the access to feed by different sized birds. 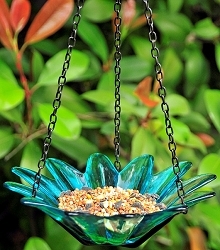 Simply adjust this clear dome close to the food tray to exclude large birds, or move it high to invite all birds. The dome locks in place and protects food from adverse weather. 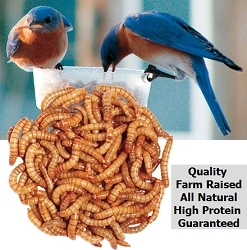 Ideal for use with live mealworms, dried mealworm and many other feeds. Micro-mesh metal feed tray keeps food fresher and dryer. Flexible installation, either hang via hook or mount on top of heavy duty feeder pole. Tough clear smooth polycarbonate dome and stainless steel swivel hook help prevent access by squirrels. Mounting: Hang or pole mount. Dimensions: 7-1/4 x 7-1/4 x 12-1/2 inches.